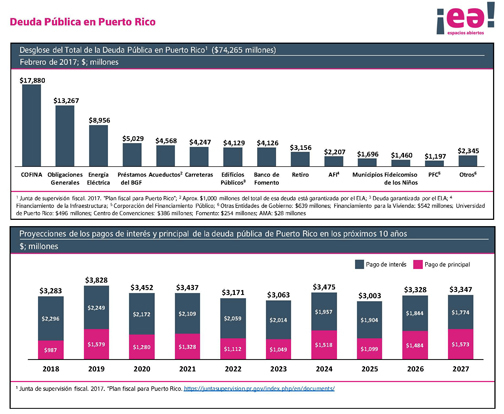 Open Spaces breaks down Puerto Rico's debt and related terms. Open Spaces breaks down Puerto Rico’s debt and related terms. In an initiative designed to give the public a better grasp of the debt crisis, the civic organization Espacios Abiertos (Open Spaces) on Monday launched a digital Spanish-language dictionary devoted to words and phrases used in the public discussion of Puerto Rico’s fiscal debacle. “In the face of a restructuring of the debt and our economic future, it is important for people to understand the language the experts use when they speak about the crisis,” said Cecille Blondet-Passalacqua, executive director of Open Spaces, during a presentation. Open Spaces is an organization that promotes transparency and government accountability. Enchautegui, who spent more than a year working on what she termed “a modest enterprise,” said the dictionary is a tool that aims to empower the public and enable people to have greater participation in the national discourse over the economic crisis. Puerto Rico’s outstanding debt is around $70 billion. In an aside, Blondet-Passalacqua told News is my Business that Open Spaces also has commissioned a debt sustainability analysis that will be prepared by Columbia University Associate Research Scholar Martin Guzman, a member of the Institute for New Economic Thinking Research Group chaired by Columbia University professor and Nobel economics laureate Joseph Stiglitz. In a visit to Puerto Rico last year, Stiglitz warned that draconian austerity measures planned by the Financial Oversight and Management Board under the PROMESA law would have a devastating effect on the economy, extending the island’s “economic depression” by another decade. Another speaker at the activity was Deepak Lamba-Nieves, research director at the Center for a New Economy, who said that an informed citizenry helps to counter the official narratives that tend to portray a situation in a better light. Pointing to the case of Detroit on the heels of its debt restructuring, he said there was much talk about the city’s resurgence but that improvement occurred mainly downtown while outer communities continued to suffer. Lamba-Nieves warned that austerity in Puerto Rico could end up being more disastrous than in Greece where private wealth plunged 40 percent between 2009 and 2015 and more painful than in Detroit where austerity led to water service shutoffs in homes that fell behind on their bills. A citizen study, “Mapping the Water Crisis,” found that these cuts mostly targeted poor areas, with large concentrations of black families. Hey Buddy!, I found this information for you: "New PR debt dictionary seen as empowering tool". Here is the website link: https://newsismybusiness.com/dictionary-empowering-tool/. Thank you.